Minimally Invasive Pancreatic Necrosectomy – How to Choose the Best Approach? Severe acute pancreatitis with infected necrosis is one of the most morbid diseases. Surgical debridement is needed for majority of patients. With increasing technology and experience, it is now possible to do necrosectomy by minimally invasive techniques. Several minimally invasive approaches to pancreas have been described, such as Laparoscopic, Retroperitoneoscopic and Endoscopic. Variations in the extent and location of the necrosis and the condition of the patient determines a tailored approach to the treatment of pancreatic necrosis. 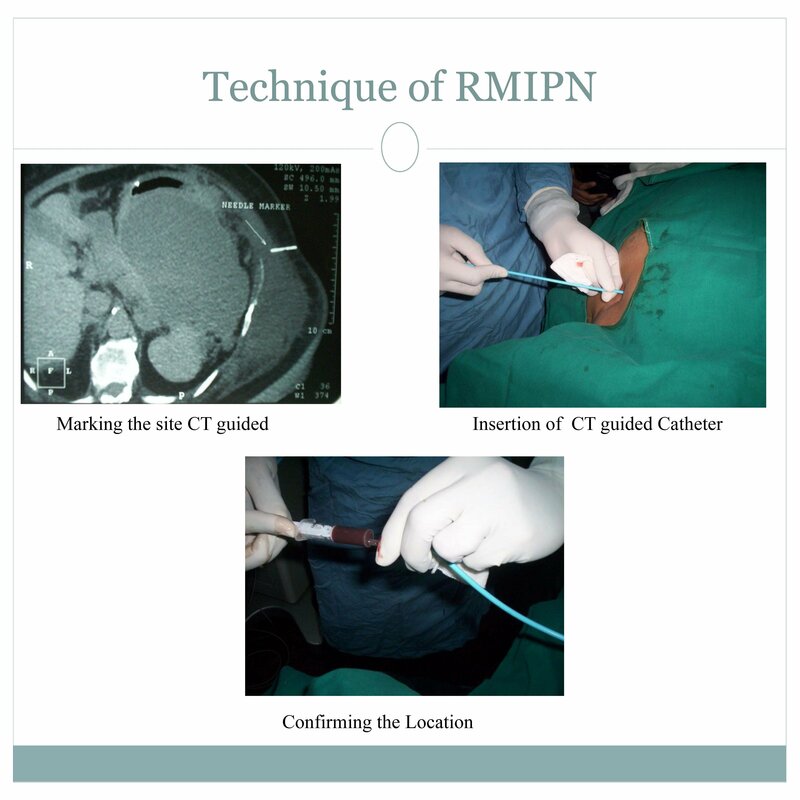 To describe our experience with the use of laparoscopic and retroperitoneoscopic methods for the debridement of the necrosis and to determine the correct approach based on local and systemic factors. 8 patients were treated by various minimally invasive techniques for infected pancreatic necrosis. The mean duration of conservative management before surgical intervention was 42 days. Evidence of infection was the presence of gas in retroperitoneum (3 cases) & FNA positivity for infection (2 cases). Entire decision-making process was tailormade for each case individually as per the patient’s history, disease condition, disease location and morphology on CT scan. A total of 8 patients underwent minimally invasive pancreatic necrosectomy. Laparoscopic transperitoneal necrosectomy was chosen in 3 patients who had primarily single collection and in patient who required simultaneous cholecystectomy. Retroperitoneoscopic (RP) necrosectomy was attempted in 5 patients who had disease involving mainly the distal pancreas and the left side of the abdomen. No patient needed conversion to open surgery. However, two patients of the RP necrosectomy group required repeat RP necrosectomy and then open necrosectomy later on. Mean operating time was approximately 100 minutes with mean post-operative hospital stay of 35.66 days. Three patients developed controlled pancreatic fistula after RP necrosectomy, which healed conservatively on follow-up (at 32, 17 and 47 days). Mortality occurred in 2 patients due to Intra abdominal bleeding and malignant hyperpyrexia. Minimally invasive pancreatic necrosectomy is feasible technique with acceptable results in carefully selected patients by experienced surgeons. Laparoscopic approach is feasible in patients who have uni-locular, retrogastric fluid collections with the additional advantage of allowing simultaneous cholecystectomy in indicated patients. Retroperitoneal approach may be selected in patients with left-sided pancreatic necrosis with predominantly semi-solid debris.